Red Dragon is a 2002 psychological horror film based on the novel of the same title by Thomas Harris. Anthony Hopkins stars as psychiatrist and serial killer, Dr. Hannibal Lecter. It is a prequel to The Silence of the Lambs (1991) and Hannibal (2001). The novel was originally adapted into the film Manhunter (1986). The film was directed by Brett Ratner and written for the screen by Ted Tally, who also wrote the screenplay for The Silence of the Lambs. Hopkins reprises Lecter, a role he played twice before in The Silence of the Lambs and Hannibal, and Edward Norton as FBI agent Will Graham. The film also stars Ralph Fiennes, Harvey Keitel, Emily Watson, Mary-Louise Parker, and Philip Seymour Hoffman. In 1980 Dr. Hannibal Lecter attends an orchestral performance of A Midsummer Night's Dream in Baltimore, Maryland. He is irritated by a flute player who repeatedly misses his part. Later, he hosts a dinner party in his townhouse for the orchestra's board of directors. During conversation, the disappearance of the flute player is brought up. When one of the guests asks about the amuse-bouche Lecter made, he responds that if he tells her, she might not try it. Lecter is visited by Will Graham, a gifted FBI agent who has the ability to empathize with psychopaths. Graham has been working with Lecter on a psychological profile of a serial killer nicknamed “The Chesapeake Ripper”, who removed edible body parts from his victims, leading Graham to believe him to be a cannibal. During the consultation, Graham discovers evidence implicating Lecter as the Ripper. Lecter immediately attacks Graham with a knife and almost disembowels him, but Graham impales Lecter with several arrows and then empties his handgun into him. Lecter is sentenced to life imprisonment in an institution for the criminally insane. Graham is deeply traumatized by the experience and retires from the FBI. Six years later, another serial killer, nicknamed “The Tooth Fairy”, appears. He has stalked and killed two entire families during sequential full moons. Special Agent Jack Crawford seeks a reluctant Graham's assistance in developing the killer's psychological profile. With the death of another family seemingly weeks away on the next full moon, Crawford guilt trips him into agreeing. After visiting the crime scenes and speaking with Crawford, Graham concludes that he must once again consult Lecter. The Tooth Fairy is Francis Dolarhyde, who kills at the behest of his alternate personality whom he calls "The Great Red Dragon". 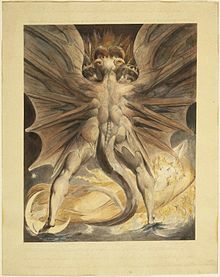 He is obsessed with the William Blake painting The Great Red Dragon and the Woman Clothed in Sun, and has the painting tattooed on his back. He believes that each victim he "changes" brings him closer to "becoming" the Dragon. His psychopathology was born from the severe abuse he suffered as a child at the hands of his sadistic grandmother. Meanwhile, Freddy Lounds, a tabloid reporter, who hounded Graham after Lecter's capture, follows him again for leads on The Tooth Fairy. There is a secret correspondence between Lecter and Dolarhyde. Graham's wife and son are endangered when Lecter gives The Tooth Fairy the agent's home address, forcing them to relocate to a farm owned by Crawford's brother. Hoping to lure out The Tooth Fairy, Graham gives Lounds an interview in which he disparages the killer as an impotent homosexual. This provokes Dolarhyde, who kidnaps Lounds and glues him to an antique wheelchair. Dolarhyde forces Lounds to recant his allegations, bites off his lips, and then sets him on fire outside his newspaper's offices. Later, at his job in a St. Louis photo lab, Dolarhyde falls in love with Reba McClane, a blind co-worker. He takes her home, where they make love. However, his alternate personality demands that he kill her. Desperate to stop the Dragon's "possession" of him, Dolarhyde goes to the Brooklyn Museum, tears apart the original Blake painting, and eats it. Meanwhile, Graham deduces that the killer knew the layout of his victim's houses from their home videos. He concludes that the killer works for the company that edits the home movies and transfers them to video. He starts searching the company processing plant and asks for the workers' personnel files, overheard by Dolarhyde as he returns from Brooklyn. Dolarhyde then leaves the plant unseen and goes to Reba's house. Dolarhyde finds that she has spent the evening with a co-worker, Ralph Mandy, whom she actually dislikes. Enraged by this apparent betrayal, Dolarhyde kills Ralph, kidnaps Reba, takes her to his house, and then sets it on fire. Finding himself unable to shoot her, Dolarhyde apparently shoots himself. Reba is able to escape the house as the police arrive. Dolarhyde, having used Ralph's corpse to stage his own death, turns up at Graham's home in Florida. He holds Graham's son hostage, threatening to kill him. To save his son, Graham slings insults at the boy, reminding Dolarhyde of his grandmother's abuse. Enraged, Dolarhyde attacks Graham. Both men are severely wounded in a shootout which ends only when Graham's wife kills Dolarhyde. Graham receives a letter from Lecter which praises him for stopping The Tooth Fairy, bids him well, and says they are going to cross paths soon. Some time later, Lecter's jailer, Dr. Frederick Chilton, tells him that he has a visitor, a young woman from the FBI. Lecter asks her name. Red Dragon: Original Motion Picture Soundtrack was composed by Danny Elfman, and produced by Mark Helfrich and Brett Ratner. Decca Records released it on September 24, 2002, in the United States and Canada. 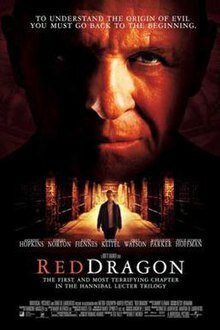 Red Dragon was released on October 4, 2002, and opened in 3,357 theaters in the United States, grossing $13,478,355 on its opening day and $36,540,945 on its opening weekend, ranking #1 with a per theater average of $10,885. On its second weekend, it remained #1 and grossed $17,655,750 – $5,250 per theater. By its third weekend it dropped down to #3 and made $8,763,545 – $2,649 per theater. Red Dragon grossed $93,149,898 in the United States and Canada and $116,046,400 overseas. In total, the film has grossed $209,196,298 worldwide. Review aggregation website Rotten Tomatoes gives a score of 69% based on reviews from 185 critics. The site's consensus says the film is "competently made, but everything is a bit too familiar", and it has an average score of 6.4/10, making the film "fresh" on the website's rating system. At Metacritic, which assigns a weighted mean rating out of 100 to reviews from mainstream critics, the film received an average score of 60% based on 36 reviews, which indicates "mixed or average reviews". Richard Corliss of Time gave the film a positive review, stating: "This darkly seductive, flawlessly acted piece is worlds removed from most horror films. Here monsters have their grandeur, heroes their gravity. And when they collide, a dance of death ensues between two souls doomed to understand each other." Todd McCarthy of Variety also gave the film a positive review, saying that the "audiences will be excused for any feelings of déjà vu the new film might inspire. That won't prevent them from watching it in rapt, anxious silence, however, as the gruesome crimes, twisted psychology and deterministic dread that lie at the heart of Harris' work are laid out with care and skill." Roger Ebert of Chicago Sun-Times gave the film 3 1/2 stars out of four, praising Brett Ratner's directing and the film's atmosphere. He stated: "To my surprise, Ratner does a sure, stylish job, appreciating the droll humor of Lecter's predicament, creating a depraved new villain in the Tooth Fairy (Ralph Fiennes), and using the quiet, intense skills of Norton to create a character whose old fears feed into his new ones. There is also humor, of the uneasy he-can't-get-away-with-this variety, in the character of a nosy scandal-sheet reporter (Philip Seymour Hoffman)." David Sterritt of Christian Science Monitor gave the film a positive review, stated that "the most refreshing aspect of Red Dragon is its reliance on old-fashioned acting instead of computer-aided gizmos. Hopkins overdoes his role at times -- his vocal tones are almost campy -- but his piercing eyes are as menacing as ever, and Ralph Fiennes is scarily good as his fellow lunatic." David Grove of Film Threat, who gave the film four stars out of five, said: "Is Red Dragon a better film than Manhunter? I don't know. I think it stands on its own, but I wonder how much people who are intimately familiar with Manhunter will be shocked by it, although the ending is altogether different and much more realized, I think". Rick Kisonak, also for Film Threat has, like Grove, gave the film a positive review and three stars out of five, saying: "The only downside to this delectable third course? The regrettable likelihood that Lecter fans will have to make do without dessert." Edward Guthmann of San Francisco Chronicle, gave the film mixed review, saying that "in Hollywood, where integrity is rapidly consumed and careers defined by market value, there's trash and there's trash with a pedigree." Stephanie Zacharek, for Salon, also gave the film a mixed review, stating: "If you buy the overprocessed headcheese of the serial killer as refined genius, you'll love Red Dragon. Or maybe not. Even Hannibal Lecter devotees may lose patience with this picture's grandiose, self-serious ponderousness -- that's Lecterese for, 'It's kind of boring in patches, actually.'" William Arnold of Seattle Post-Intelligencer who gave the film a mixed review, said that the film "basically lives up to the old adage that the final work in a trilogy is invariably the weakest." Michael Atkinson of The Village Voice gave the film a negative review, he stated: "Red Dragon's formula is so risible and rote by now that the natural reaction to scenes of peril, torture, and suffering is flippant laughter." Red Dragon was nominated for 13 awards, and won several, including Empire Award for Best British Actress (Emily Watson) and Young Artist Award for Best Performance in a Feature Film – Young Actor Age Ten or Younger (Tyler Patrick Jones). ^ a b c d e "Red Dragon (2002)". AFI Catalog of Feature Films. Retrieved December 31, 2017. ^ "Red Dragon (15)". British Board of Film Classification. September 26, 2002. Retrieved October 5, 2016. ^ a b "Red Dragon (2002)". Box Office Mojo. IMDb. Retrieved March 14, 2012. ^ "Red Dragon [Original Motion Picture Soundtrack]". AllMusic. All Media Guide. Retrieved July 24, 2012. ^ "Daily Box Office for Friday, October 4, 2002". Box Office Mojo. IMDb. Retrieved July 22, 2012. ^ "Weekend Box Office Results for October 4-6, 2002". Box Office Mojo. IMDb. Retrieved July 22, 2012. ^ "Weekend Box Office Results for October 11-13, 2002". Box Office Mojo. IMDb. Retrieved July 22, 2012. ^ "Weekend Box Office Results for October 18-20, 2002". Box Office Mojo. IMDb. Retrieved July 22, 2012. ^ "Red Dragon (2002)". Box Office Mojo. IMDb. Retrieved July 22, 2012. ^ "Red Dragon". Rotten Tomatoes. Flixster. Retrieved March 14, 2012. ^ "Red Dragon". Metacritic. CBS Interactive. Retrieved July 22, 2012. ^ Corliss, Richard (September 30, 2002). "Here Be Monsters". Time. Time Inc. Retrieved July 22, 2012. ^ McCarthy, Todd (September 26, 2002). "Film Reviews: Red Dragon". Variety. Reed Business Information. Retrieved July 22, 2012. ^ Ebert, Roger (October 4, 2002). "Red Dragon". Chicago Sun-Times. RogerEbert.com. Retrieved July 22, 2012. ^ Sterritt, David (October 4, 2002). "The doctor is in: Hannibal returns in 'Lambs' prequel". Christian Science Monitor. Retrieved July 24, 2012. ^ Grove, David (October 4, 2002). "Red Dragon". Film Threat. Hamster Stampede LLC. Retrieved July 24, 2012. ^ Kisonak, Rick (October 8, 2002). "Red Dragon". Film Threat. Hamster Stampede LLC. Retrieved July 24, 2012. ^ Guthmann, Edward (October 4, 2002). "'Dragon' has no bite / All-star cast fails to make 'Silence of the Lambs' prequel appetizing". San Francisco Chronicle. Hearst Communications Inc. Retrieved July 22, 2012. ^ Zacharek, Stephanie (October 4, 2002). "Red Dragon". Salon. Salon Media Group, Inc. Retrieved July 22, 2012. ^ Arnold, William (October 3, 2002). "Lecter series has run its course, but Hopkins is still delicious". Seattle Post-Intelligencer. Hearst Communications Inc. Retrieved July 24, 2012. ^ Atkinson, Michael (October 1, 2002). "Monsters, Inc". The Village Voice. Village Voice Media Holdings, LLC. Retrieved July 24, 2012.